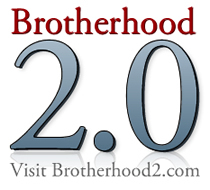 Though Jaleh beat me to it, I've been wanting to post about Brotherhood 2.0, but couldn't quite bring myself to. Mostly, how in a few short days, I won't have a daily dose of brothers John and Hank Green. And how this so saddens me, and even hurts a little bit. I've been there since the very first video - watching puff levels, reveling in happy dances, learning about the political situation in Tibet, and mostly laughing and getting to virtually know this two interesting, hilarious, engaging boys. I even met John and ALA, and had a little Nerdfighterly moment. And come December 31, the Nerdfighters will have no video to watch every day. What a great gift we've been given this year, and the only thing I can say it...please, sir(s), may we have some more? Sigh. I don't even want to think about it. Anyway, I hope you are signed up for their secret project mailing list. they said they would update the nerdfighters there.